With crazy busy schedules and multiple responsibilities we're all juggling, it's a really good idea to take advantage of premade or prepared ingredients at the grocery store to help with dinner. With a little bit of advanced meal planning, you can avoid feeding your family overprocessed or fast food in almost the same time it would take to have pizza delivered or to get to a restaurant and back. With premade pizza crusts and packaged salad greens, this meal requires only simple assembly. Open packages, toss, and serve. 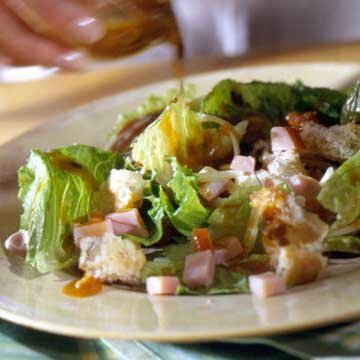 1For dressing, in a small bowl, combine the Western or French salad dressing and the fresh basil or oregano; set aside. 2In an extra-large bowl, toss together the torn romaine lettuce, bread shell pieces, Canadian-style bacon or pepperoni, and cheese. Transfer to dinner plates. Drizzle each serving with dressing. Toss salad lightly to coat. Makes 4 main-dish servings. 3Dietary Exchanges: 2 starch, 2 vegetable, 2 lean meat, 1/2 fat.